How is it Passover and Easter again? I've been thinking a lot about the passage of time lately. Having a sick parent has made me feel more like an adult than any other milestone has, while simultaneously making me feel like a helpless kid. How am I old enough to sleep next to a hospital bed and interact with doctors who seem to think I know what I'm doing? And also, isn't someone else supposed to take care of this stuff? Like, the mom who's in the hospital bed? 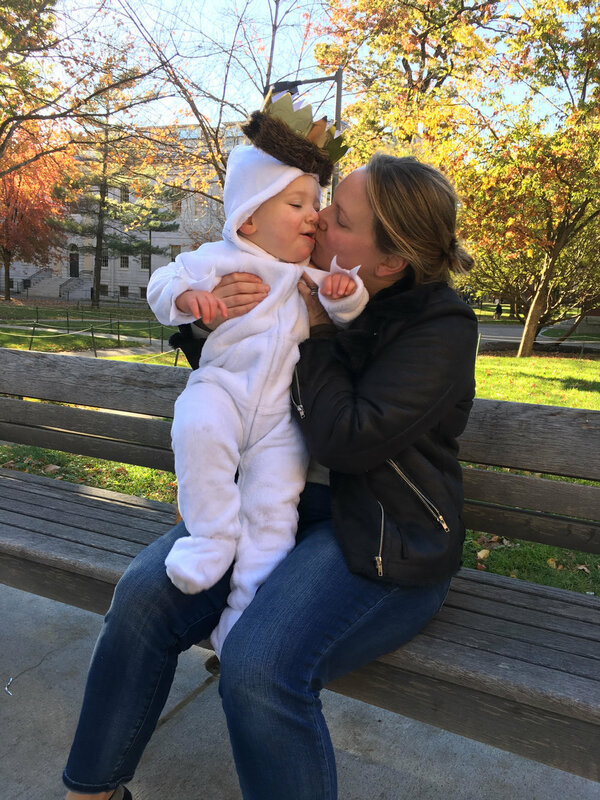 Last week was also M's 3rd birthday and while I felt the obligatory, "How is this kid 3 already?" I also felt a little bit like, "How is he only 3?" In the best way possible, it feels like he's always been here. So yeah, time. It flies and crawls. M also starts school on Monday. Real school where I drop him off every day and he makes friends and has relationships with teachers and learns things that I don't know. We flirted with this type of setting before we moved last summer, but then we relocated and decided to get on a waiting list for a school we liked instead of jumping right in as soon as we got to Connecticut. So! This means I'll be actually posting lunchbox meals over on instagram instead of talking about them theoretically. 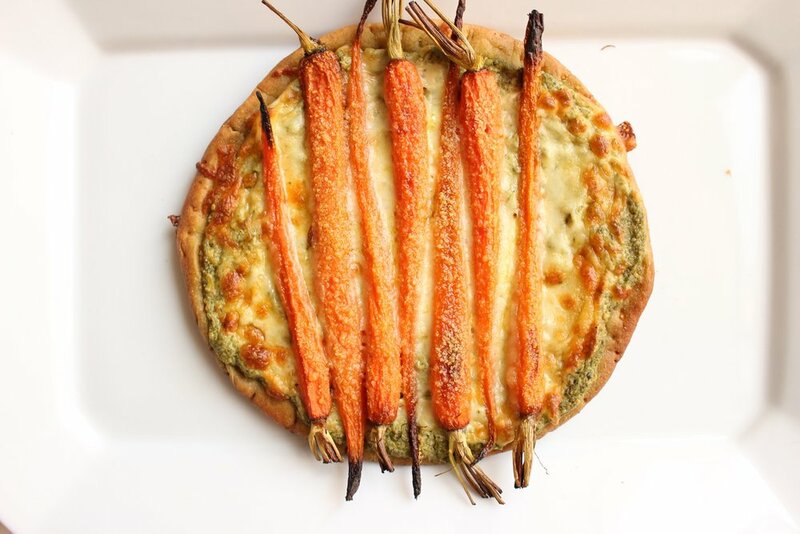 This carrot pizza is a good place to start! First, it's "pizza" which is appealing to lots of kids. Carrots are also a good gateway vegetable because they're sweet, especially when roasted. A few notes about the pesto: We're lucky that M's classroom isn't nut-free, but if your school is, swap in pumpkin seeds or sunflower seeds for the cashews. Also, the carrot tops lend a fresh, green taste to this pesto. Use 2 packed cups of carrot tops and basil, in whatever ratio you want. My carrot tops usually measure between 1 and 1.5 cups, so I fill up the remaining cup with basil. And be sure to pack it tightly. Preheat the oven to 400. 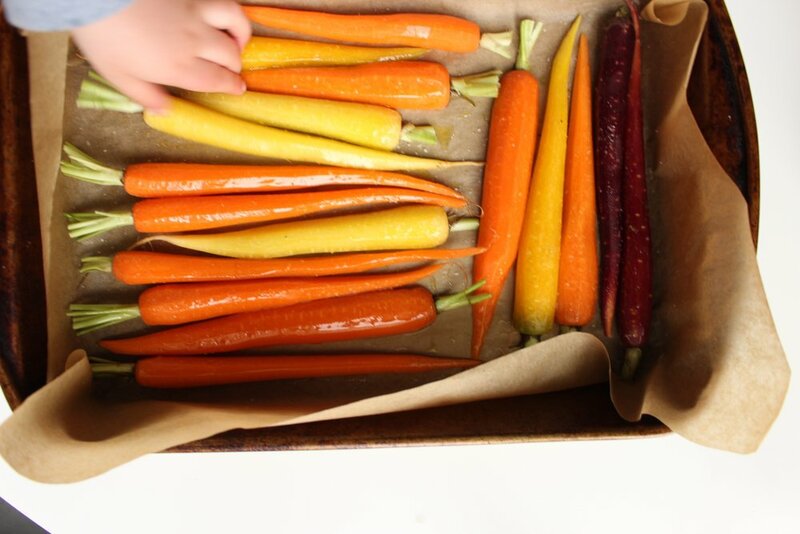 Peel the carrots and arrange in roasting pan. Add oil and salt and roast for 35-40 minutes, until thickest part of the carrot is fork tender. 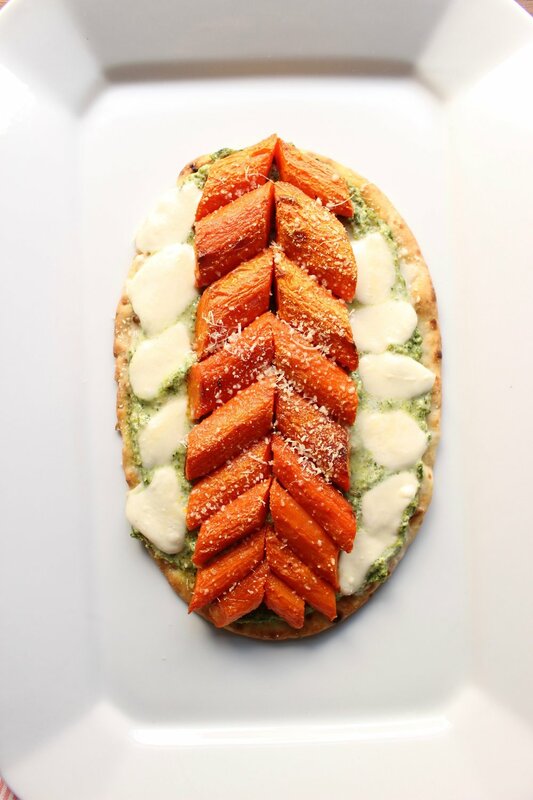 To arrange the flatbreads: Mix together the ricotta and pesto. Spread 2 Tbsp of the cheese and pesto mixture on top of the flatbreads. Top with about 1/4 – 1/3 cup of mozzarella. Arrange carrots in whatever pattern you like and top with 1 Tbsp parmesan. Bake for 8-10 minutes, until the cheese has begun to brown and the breads are crispy.